Stavento - Explore the best destinations! The Stavento complex is right in front of the Blue Flaged organized beach of Pounta near of the city of Aegio. The elegant, spacious guest rooms are decorated in modern style with rich equipment, marble floors and quality furniture. Wooden headboards and white bed covers on the king size beds add luxurious touches. 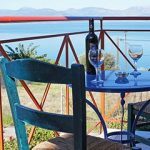 Excellent views of Corinthian gulf and the surrounding mountains from the balcony. Umbrella and sun beds with beach towels waits for you, in front of the property, according service from the beach bar. Excellent location. Fully equipped kitchen, kitchen ware, oven, stove top, refrigerator, freeze. Nespresso coffee machine and capsules, as well as filter coffee, tee, Greek coffee, on kitchen facilities. Organic local wine and Greek or Frence Champaigne on request with exrta charge. Marble floors. 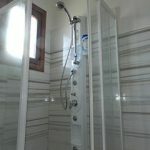 Marble bathroom with hydro massage column shower cabin. Flat Screen TV with up to 150 International Satellite Channels. Free Wi-Fi. High quality, from 100% Egyptian cotton, linen and towels. Individual controlled, heating & cooling system, easily adjustable by the guests at their desirable temperature. 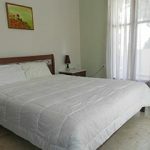 The elegant, spacious guest rooms are decorated in modern style with rich equipment, marble floors and quality furniture. Wooden headboards and white bed covers on the king size beds add luxurious touches. 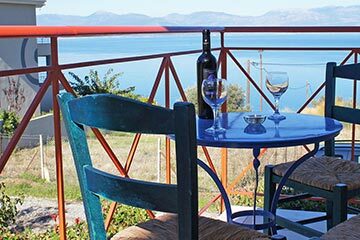 Excellent views of Corinthian gulf and the surrounding mountains from the balcony. 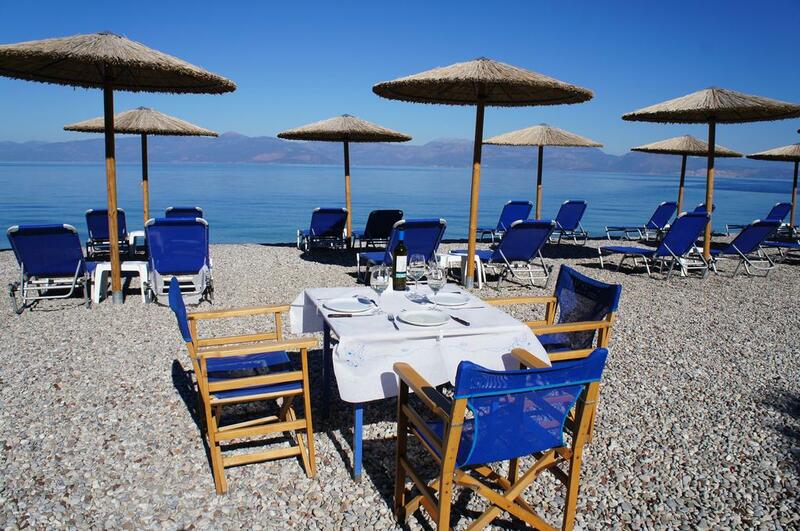 Umbrella and sun beds with beach towels awaits for you, infront of the property, according service from the beach bar. Excellent location. Fully equipped kitchen, kitchen ware, oven, stove top, refrigerator, freeze. Nespresso coffee machine and capsules, as well as filter coffee, tee, greek coffee, on kitchen facilities. Organic local wine, Greek or Frence Champaigne on request with exrta charge. Marble floors. 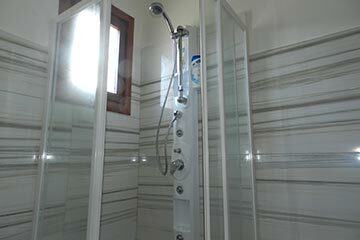 Marble bathroom with hydromassage column shower cabin. Flat Screen TV with up to 150 International Satellite Channels. Free Wi-Fi. High quality, from 100% Egyptian cotton, linen and towels. Individual controlled, heating & cooling system, easily adjustable by the guests at their desirable temperature. 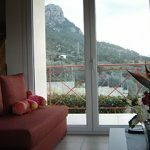 This brand new (2014) villa, built at the top of 150m vertical rock, has a private entrance, private furnished veranda, garden and parking space. On the ground floor, there is the living room (salon) with fire place, the fully equipped kitchen with dining area (plus 1 bathroom with shower) that opens onto a furnished terrace with real JACUZZI, for seamless transitions between indoor and outdoor living. On the first floor, there are 2 separate bedrooms with 2 independent sea view balconies and the main bathroom with bath tub. 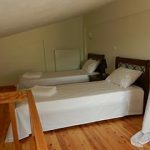 On the upper floor there is a third bedroom ideal for kids. Very well furnished and decorated in modern style. Jacuzzi is outdoor, for 5 to 6 persons, adjusted at 34 C water temperature. Individual controlled heating & cooling system is provided, that guests are able to adjust temperature at their desire. Private internet line, Ethernet & Wi-Fi access is available for free. Wooden floor parquet at all bedrooms. Soundproof doors and windows. Flat screen TV with up to 150 satellite international channels, mini Hi-Fi with radio, CD player, USB, MP3 provided. High quality, 100% fine Egyptian cotton linen and towels. 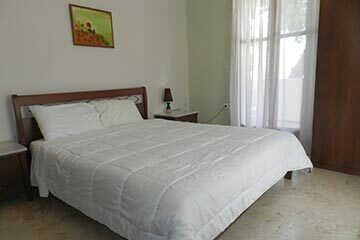 Fully equipped kitchen, full kitchen ware, oven, ceramic stove top, large refrigerator, freeze, washing machine. Nespresso coffee machine and capsules, as well as filter coffee, tee, Greek coffee, on kitchen facilities. Organic local wine, Greek or Frence Champaigne on request with exrta charge. 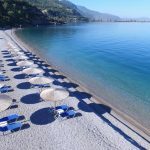 Beach towels waiting you onto sun beds at blue flag awarded famous Pounta beach, while the staff of beach bar is ready to serve you. This brand new (2015) villa, built at the top of 150m vertical rock, has a private entrance, private furnished veranda, garden and parking space. On the ground floor, there is the living room (salon) with fire place, the fully equipped kitchen with dining area (plus 1 bathroom with shower) that opens onto a furnished terrace for seamless transitions between indoor and outdoor living. 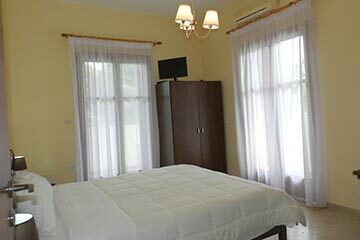 On the first floor, there are 2 separate bedrooms with 2 independent sea view balconies and the main bathroom with bath tub. On the upper floor there is a third bedroom ideal for kids. Very well furnished and decorated in modern style. Individual controlled heating & cooling system is provided, that guests are able to adjust temperature at their desire. Wi-Fi access is available for free. Wooden floor parquet at all bedrooms. Soundproof doors and windows. Flat screen TV with up to 150 satellite international channels, mini Hi-Fi with radio, CD player, USB, MP3 provided. High quality, from 100% fine Egyptian cotton linen and towels. Fully equipped kitchen, full kitchen ware, oven, ceramic stove top, large refrigerator, freeze, washing machine. Nespresso coffee machine and capsules, as well as filter coffee, tee, Greek coffee, on kitchen facilities. Organic local wine, Greek or Frence Champaigne on request with exrta charge. 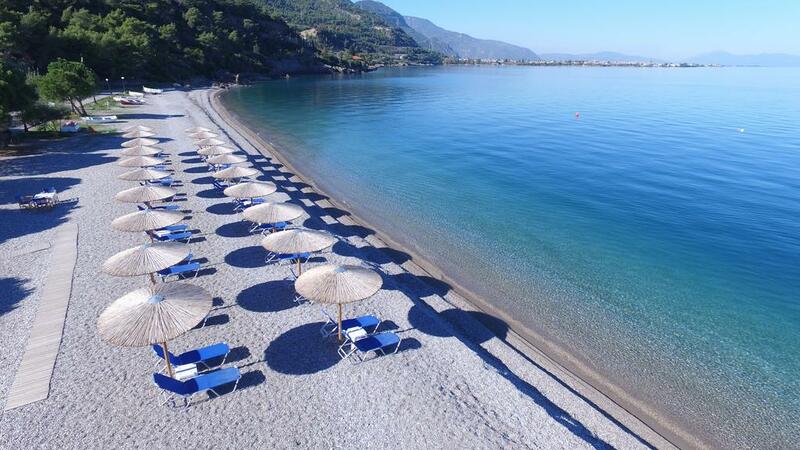 Beach towels waiting you onto sun beds at blue flag awarded famous Pounta beach, while the staff of beach bar is ready to serve you. 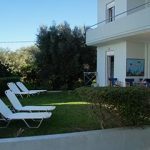 This seaside maisonette has a private entrance, private furnished veranda, garden with sun beds and parking space. On the ground floor, there is the living room (salon) with fire place, the fully equipped kitchen with dining area (plus 1 bathroom with shower) that opens onto a furnished terrace for seamless transitions between indoor and outdoor living. 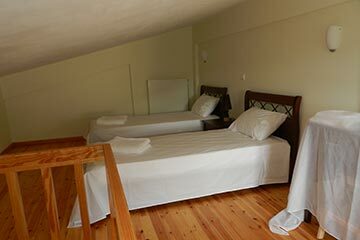 On the first floor, there are 2 separate bedrooms sharing the same, sea view, balcony and the main bathroom with hot tub. On the upper floor there is a working office and a third bedroom ideal for kids. 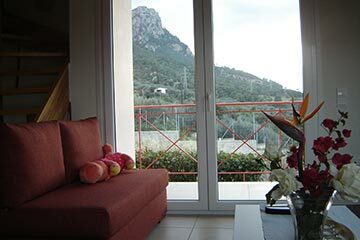 Very well decorated in modern style and furnished with quality hand made furniture. The, individual controlled, heating & cooling system, is easily adjustable by the guests at their desirable temperature. Private internet line, Ethernet & Wi-Fi access is available for free. Wooden floor parquet at all bedrooms. Soundproof doors and windows. Flat screen TV, Hi-Fi with radio, CD player, DVD player, is provided. 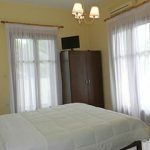 Fully equipped kitchen, full kitchen ware, gas oven, gas stove top, large refrigerator, freeze, microwave oven, dishwasher, washing machine. Nespresso coffee machine and capsules, as well as filter coffee, tee, Greek coffee, on kitchen facilities. Organic local wine, Greek or Frence Champaigne on request with exrta charge. High quality, from 100% fine Egyptian cotton linen and towels. 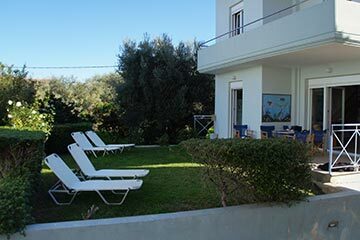 On the beach, in front of the villa, umbrella and sun beds are waiting for you.